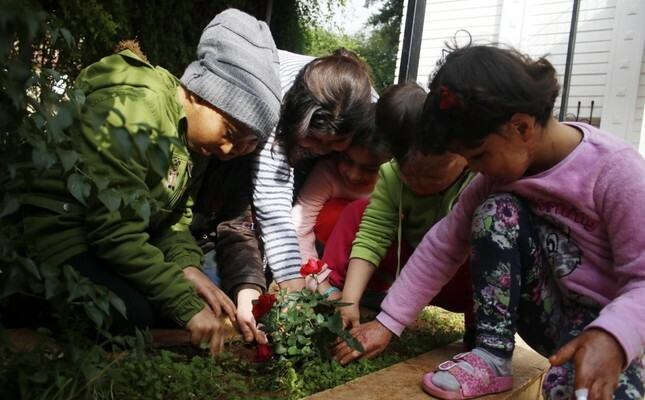 Children plant roses during their first outing in months. As the conflict in Syria nears its seventh anniversary, the emotional and physical scars it has left on millions of Syrians remain. Eight children felt both, when their bodies, faces, hands and feet were burned in bomb attacks and chemical attacks. Slowly recovering after treatment in Antalya, the Mediterranean Turkish city, they left the clinic for the first time yesterday to play on a playground. In the company of Turkish volunteers who help them with treatment and accommodation, the eight children - the youngest age 3 and the oldest 10 - swung on swings, danced in front of a mirror where they could see their partly healed faces and planted flowers. Bara, Jana, Amra, Abdulselam, Mohammed, Manaher, Usama and Diana hail from Hama, Aleppo and Idlib, flashpoint towns where Bashar Assad's forces regularly launch attacks against the bastions of the Syrian opposition. Most of them lost their parents in the attacks and were brought to the Turkish border by relatives. Taken in by charities at the border, they settled in Antalya where a clinic handled their treatment. The treatment helped mitigate their pain, though scars are still visible all over their bodies, distorting their smiles as they run around the playground. Bara is still working on moving his burned fingers, while Usama will have more plastic surgeries for burns on his face. Mindful of the delicate stitches on their faces and hands, doctors only allowed a short outing at the playground, but it was sufficient for the children, grateful for outdoor playtime for the first time in months. Once their treatment is complete, they will be returned to relatives taking shelter in Turkey. Ayşegül Güneş, a "volunteer mother" who looks after the children, said coming to Turkey was "a matter of life" for the children. "They came here to stay alive and to get rid of severe burns. Some are children of internally displaced families who were staying in tents when the bombs were dropped. Most were born in the middle of the war, and they need love. They like being hugged and talking to people," she says, adding that their morale was higher now. "They know they are in a safe place now. We are so glad to get to know them," she adds. Mohammed, who lost his father in the bombing that left scars on his face, has been separated from his mother and siblings for treatment. He counts down to the day he will reunite with them in Istanbul where the family now lives. "I will go in three weeks. I want to be a doctor and help other children," he says. Since the conflict started in Syria, Turkey has been the first destination for the majority of displaced people seeking a safe haven. The latest figures show that the country hosts more than 3 million refugees, the largest refugee population from Syria in the world. Antalya is among the cities with a low number of refugees, while a small fraction of the total refugee population is accommodated in refugee camps near the Turkish-Syrian border.